The Ritz-Carlton, Bahrain Hotel & Spa is set within lushly landscaped gardens, with the iconic building opening its wings to cerulean seas on one side and the vibrant Manama Bay on the other. The property presents an oasis that appeals to the most discerning travellers as Phil Blizzard discovered on his ‘Ramadan Tour’ of the region. 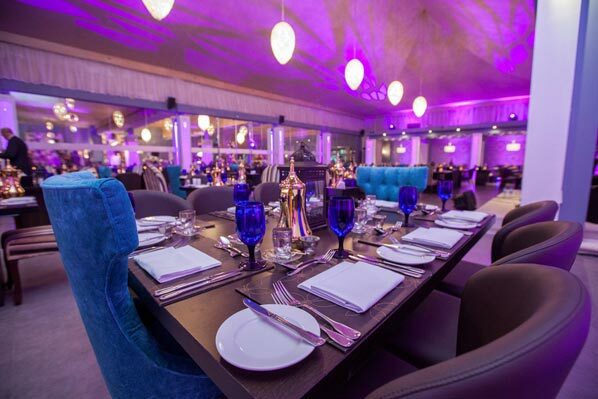 For the Holy Month of Ramadan the theme adopted by Bahrain’s premier hotel is ‘Discover the 1,001 nights’ and this takes place in Al Khayma Tent with the Bahraini tradition of a Ghabgha buffet, along with daily entertainment from an Arabic singer in order to celebrate in style. The Ghabga buffet in Bahrain typically includes fish as the main dish along with mhammar, a rice dish cooked in sugar or molasses. 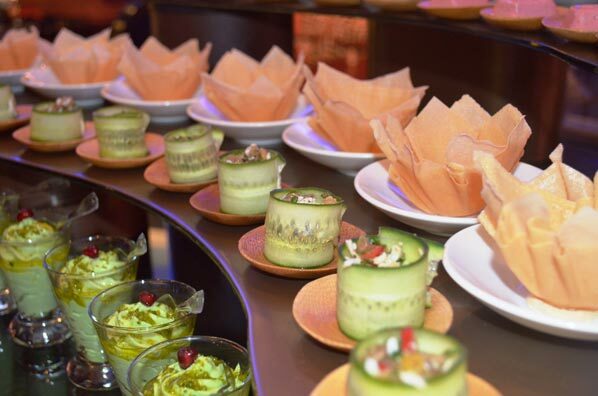 In Al Khayma this is complemented by live cooking stations where guests can savour freshly baked Arabic breads, traditional mezzeh, and a selection of mouth-watering Arabic sweets. Talking to Soufiane El Allam who is the hotel’s director of sales and marketing, about their main focus of ‘Discover 1,001 nights’ he said: “The focus on food is of course as essential and this year the commitment has been put on live cooking stations (the Arabic cheese and pickles, the veal steam ship and prime carving are additions this year), to create a personalized cuisine for each guest. To do this the hotel has flown in two specialty chefs for making Egyptian bread, manakaesh, as well as a locally-hired Bahraini artist to make local sweets and bread. The Ritz-Carlton, Bahrain also supports local fishermen with the purchase of daily fresh produce and inclusion in the tent menu. The same goes with the large selection of dates, a local favourite during the holy month, which are sourced from the local farmers. El Allam also told Breaking Travel News: “We are honoured to see our selection of clientele being a mix of the communities of Bahrain and beyond as we also notice travellers coming from the region and especially from the Eastern province of Saudi Arabia. “This year, it seems that our Al Khayma has been Bahrain’s venue of choice to celebrate Ramadan and our tent has been full since day one and our booking pace until the last day has forced us to re-schedule some demands. Finally I asked him what Ramadan meant to him and his associates. “Ramadan is the time of charity – giving back to other, to the community, to our planet – it is also a privileged occasion for family bonding as most businesses work for fewer hours. “For me, it is also a time of introspection, of positive change and of self-discovery. Being the only city-resort, The Ritz-Carlton, Bahrain Hotel & Spa combines summer fun, shopping spree with complimentary shuttle service and convenient access to all the cultural landmarks of the destination. The extensive facilities include 600 meters of secluded beach, an outdoor and indoor pool and whirlpool, a private island, a Sports Club and Royal Spa with Hammam and Thalassotherapy, providing a wide range of recreation opportunities and pampering treatments. The Ritz-Carlton, Bahrain Hotel & Spa is recognised by the World Travel Awards as Bahrain’s Leading Hotel, and has won that accolade each year since 2004. More information can be found on the hotel’s official website website.